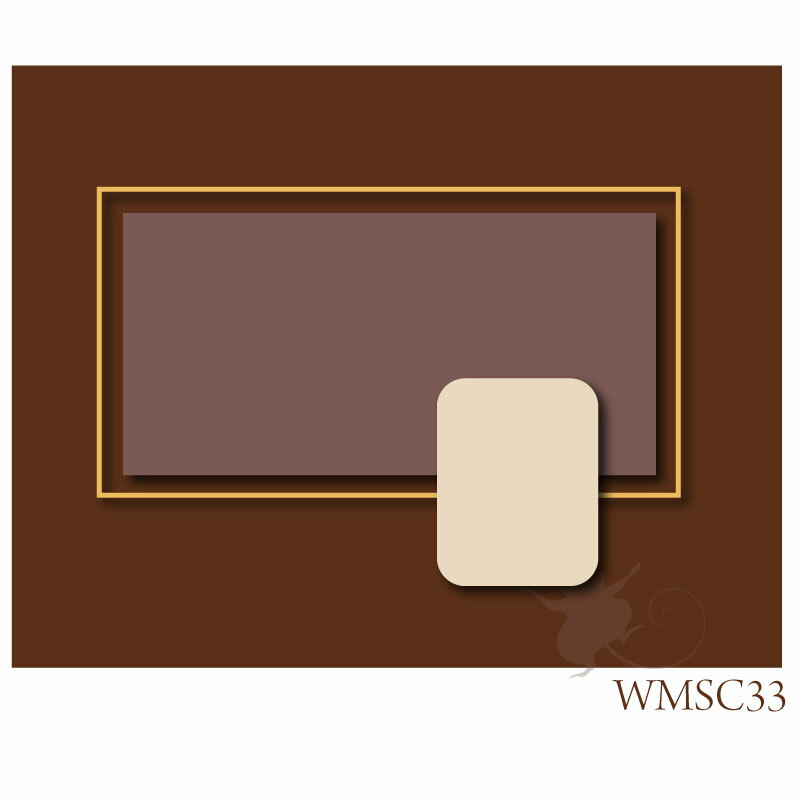 Good morning, it's time for a new sketch at the Waltzingmouse Sketch Challenge (WMSC33). This one's pretty easy, I turned it on it's side for my card. Here's the sketch!! This is not the first card I made, I attempted a clean and simple card!! It took longer than my usual cards and I wasn't that comfortable with it, it was an interesting experience anyway. You'll see it at the end of this post! 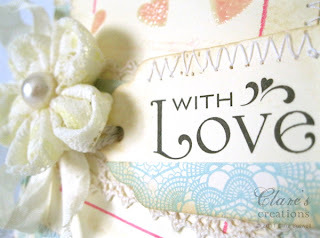 I used Fancy Phrases from Waltzingmouse Stamps for the sentiment. My sewing machine was 'having a moment' apologies for the wonky stitching!! The lace flower I made is a Kanzashi flower. 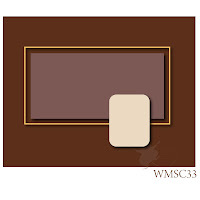 I stamped the frame using Frame-It from Waltzingmouse Stamps. 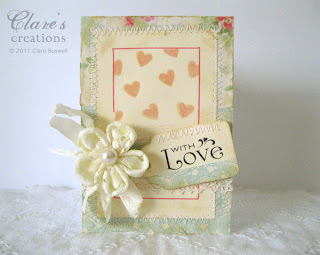 I masked the border and stamped the little hearts from Sweethearts in a pattern in the centre, firstly in a light pink then using VersaMark and I heat embossed them with some clear embossing powder. 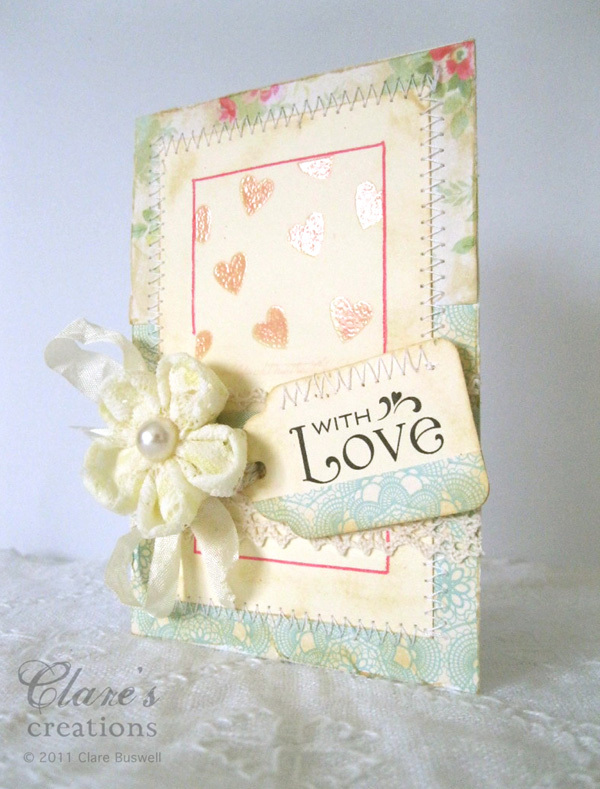 The patterned papers are from October Afternoon - The Thrift Shop and Papermania Rose Garden. I inked the edges with some Tim Holtz Distress Ink in Antique Linen. Now for that 'other' card I mentioned!! It's a fun card, I like the movement of the butterflies through the card and I love the big butterfly but I think I just overdid it a bit. Oh well. 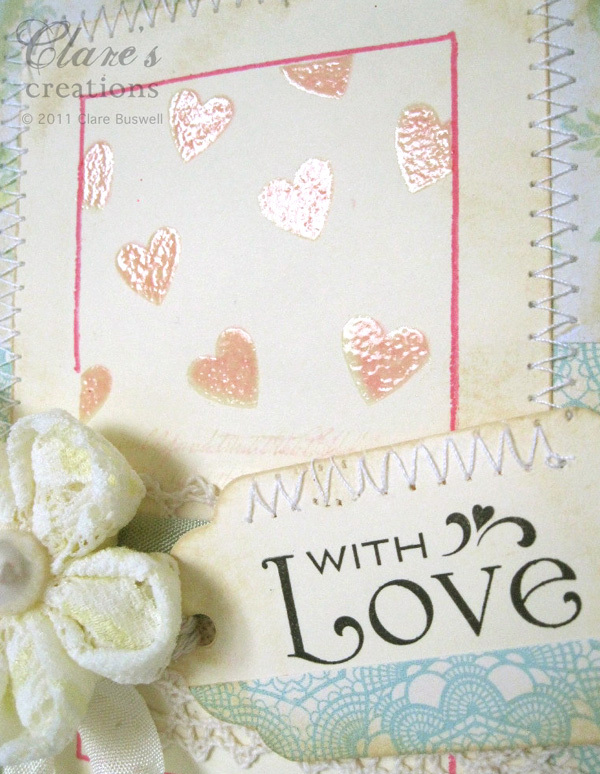 The heart stamps are from the Sweethearts set from Waltzingmouse Stamps. The star swish and little star stamp are from Teeny Trees from Waltzingmouse Stamps. Don't forget to have a look at the fabulous creations from the rest of the Mischief Makers and some of the Design Team. Oh and there's an exciting announcement over at the Waltzingmouse Sketch Challenge, go check it out!!! Enjoy the rest of the weekend!! AND Happy Birthday to fellow Mischief Maker Lenet!! Other: Cream seam binding, lace fabric, pearl, sewing machine, Die cutting machine, Sizzix tags scallop, clear embossing powder, heat gun, crochet lace. 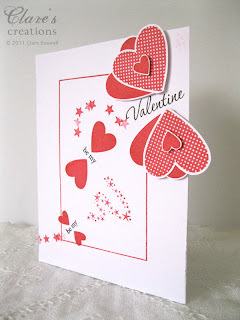 Love your card and that gorgeous flower, and BTW, I love the second card too, very pretty. 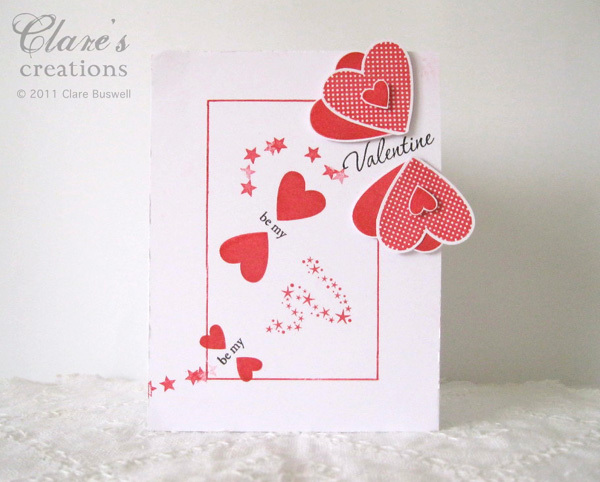 What wonderful rose paper and fun heart stamping Clare - a very romantic valentine! and love your heart butterfly on the 2nd! so fun! 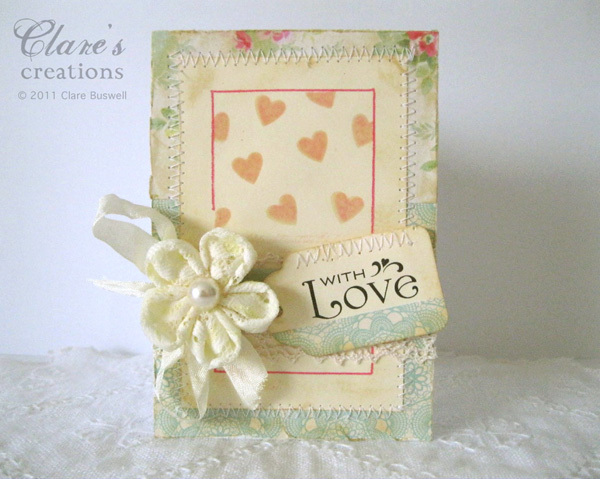 Clare - I think the CAS butterfly CAS card is wonderful and certainly not overdone!! I love it. I really like how you've created the butterfly trail. I like the vintage heart one too - it's very pretty. But I love the second best!! Oh I love your first card. So soft and shabby chic. Never heard of a Kanzashi flower. But it sure is beautiful. And I love the next card too! What a wonderful Valentine butterfly. Lovely creations Clare! Love how soft and pretty the first one, and love the stunning in red, thanks for sharing! I think they are both gorgeous although the first one is my favorite :). I am not able to create a CAS card; I have a place in my heart for (lots of) embellishments :). But I think you did a fabulous job with it! Both cards are beautiful, Clare. But...being a flower lover, my favourite is the one with the Lace Kanzashi flower. Adorable cards, Clare! Love that flower.